The Rockstar Energy Husqvarna Factory Racing team saw a new face under the tent as Dean Wilson joined the ranks for the remainder of the 2017 season, starting this weekend at the Oakland Supercross, the fifth round of the series, held at O.Co Coliseum. The team made a great showing with two heat race wins, a podium finish for Davalos in the 450 main, and two more top-ten finishes for Anderson and Wilson in their respective main events. 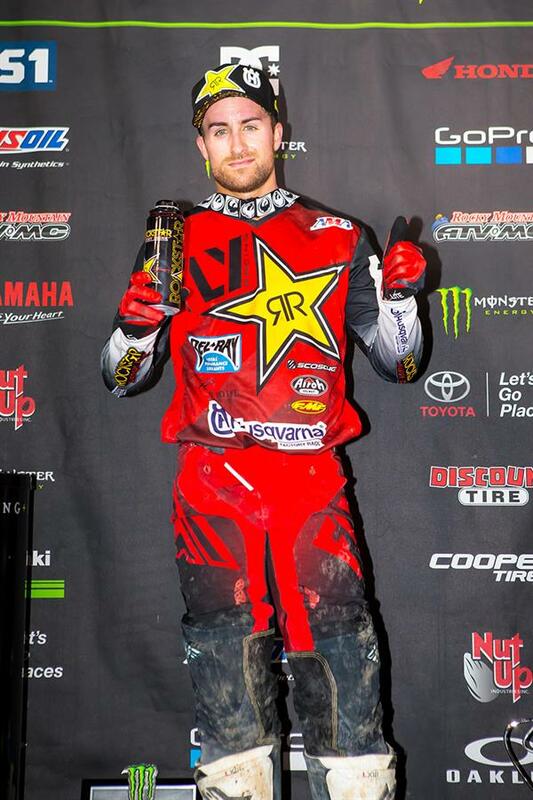 Martin Davalos got third at the start of his 250SX West heat and made the pass for second in the second lap. He inherited the lead in lap three and held strong for his third heat win of the year aboard his Husqvarna FC 250. He pulled the hole shot in the main and moved to second soon after and continued to battle. He stayed consistent the remainder of the race and scored a second-place podium finish. He is currently fourth overall in 250SX West rider point standings. "Today was more like what I’m used to,” said Davalos. “I like ruts and a technical track. I started off with a pretty good practice and, surprisingly, the track was amazing despite the rain. I got a good start in the main but made a mistake in the first lap and Justin got by me. I was trying to ride a smart race, but it was tough to make up time. I’ll take the podium finish, and we’re still in this to the last race. I’ll be racing hard until Vegas." Jason Anderson pulled the holeshot in his heat and never looked back, earning the Rockstar Energy Husqvarna Factory Racing team its second heat race win of the night aboard his Husqvarna FC 450. He got a second-place start in the main and immediately started battling to protect his position. He moved to third after getting passed in the whoops, and fell to fifth in the fifth lap. Continuing to push, he stayed hot on the heels of Cole Seely and made the pass for fourth around the tenth lap and charged hard to the finish. He is currently sixth overall in 450 rider point standings. “I had a much better race compared to last week,” said Anderson. “I started off decent in practice then just tried to keep learning the track and be better than I was the last few weekends. It’s good to come out and get a top-five. I’ll try to get better from here." Dean Wilson went down in the sand early in his heat, but immediately started putting in work to make his way through the field. He was 10th by the third lap, continued to advance, and finished eighth. He got in qualifying position early after the start of his semi and held his ground. He made an impressive corner pass for third in the third lap, but made a mistake in the first rhythm section and finished out of qualifying position, forcing him to go to the LCQ. He pulled the holeshot in his LCQ and held strong for the win and a spot in the 450 main. He started mid-pack in the main, pushed his way to ninth by the third lap, and stayed consistent the majority of the race before finishing 10th. He leaves Oakland 10th in 450 rider point standings. “I’ll take today as a pretty good positive,” said Wilson. “I qualified really well - I haven’t been on the board all year - ended up sixth overall so that was a great start. It’s such an exciting week for me since getting on the team. I fell first lap of my heat race in the sand. I went into the semi, made the pass for third, but then made a rider error and crashed again. I went into the LCQ - I just put in all the laps tonight - and won that. I went into the main event and was in a seventh position battle and was feeling pretty good, but then just got kind of tired in the end. The track was gnarly, but I survived and got 10th - my first top 10 of the year - so I’ll take it and move on from here." Davalos, Anderson and Wilson will now make their way to AT&T Stadium in Arlington, Texas for the sixth round of the series, to be held next Saturday, February 11.